ETN- European Textile Network, The Textile Museum in Borås, The Swedish school of Textiles - University Borås, the City of Borås and NTA-Nordic Textile Art welcome you to Borås in September 2017. The Conference aims to present a global perspective of the different textile practices and their interactions with a special focus on sustainable creativity and innovation in Textile art and design. 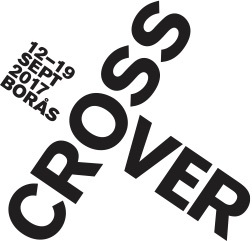 The theme for the days in Borås is crossover. Date: 13 – 19.9 2017 september 2017. 18th -19th september, Post - conference - optional tours, workshops. NTA are organizing a workshop at the museum in RYDAL on the 14 of september, for one day. NTA member exhibition, all attending members to the workshop in Rydal. That means everybody are bringing one piece of art ready to hang on the wall. On the 16th of September the grand opening of the NTA exhibition EVERYDAY MATTER at the Textile Mueum of Borås. On the 14 of september, workshop at Rydal and exhibition, visitors coming with buss from Borås for the exhibition opening. In the evening, dinner at Wärdshuset Spinnaren in Rydal. As a member of Nordic Textile Art you will pay the same fee for the conference as the members of ETN. Mats Johansson, (SE), University of Boras - Head of Prototype Factory/Smart Textiles. “What can smart textiles be in the future and how can we stop producing them in a stupid way”. Beatrijs Sterk, founder and former Secretary General of ETN and fomer publisher and editor-in-chief of Textile Forum Magazine. Textiles in Fine Art – a Blessing or a Curse? Faig Ahmed, contemporary artist. Conceptual approach to traditional textiles. Solo exhibition on view at the Textile Museum opening June 2017. www.faigahmed.com. Jun Tomita, Building the Future Departing from Tradition. Artist, teacher and author on kasuri weaving. Catharine Ellis and Joy Boutrup. The process of collaboration between art and science. Digital weaving on the TC2 by Vibeke Vesby. Printing on Cellulosic Fibres with Natural Dyes. Catharine Ellis and Joy Boutrup. Natural dyes and processes - Jeanette Schäring. Art in nature with textile materials - Hannah Streefkerk. Size memories – Powertool - Workshop only NTA members at Rydal. NTA welcomes new members to join. In the afternoon tour from Borås to the exhibition openings and dinner. (You do your registration for this workshop and exhibition to NTA info@nordictextileart.net) Read more about XXXXOVER RYDAL here. Textile Museum, Faig Ahmed, International solo exhibition. Opens 6 May, 2017. Textile Museum, Everyday Matter, Nordic Textile Art, Opens 16 sept 2017. Borås Museum: Letter to my Dear. Ålgården Konstgrafiska verkstad: ”Tusen nålar”. Jeanette Ölund gallery: Fredrik Nielsen & Britta Carlström. Rydal Museum: TEXO, Finnish Textile Organization “Johtolanka” the 10th TEXO triennial. Opening 3 June. Exhibition tours at satellite arenas. Textile Industry and Art excursion in the region. Med stöd från: Nordisk kulturfond, Nordisk kulturkontakt, Kulturrådet, Helge Ax:son Johnsons stiftelse, Estrid Ericsons Stiftelse, Clara Lachmanns stiftelse, Tore G Wärenstams stiftelse, Stiftelsen Längmanska kulturfonden.